I haven’t met Maya Liberman yet, but I can tell you she’s one smart cookie! Along with earning an MBA, this busy Oakville mom spent 10 years in the packaged goods industry and five years working in product development for Loblaws. For the past two years, she’s used her experience as a professional product developer and as a mom to create her first kitchen gadget – The Smart Cookie. The flexible two-piece BPA-free mat, about the size of a tablet, lets you store extra cookie dough in the freezer. 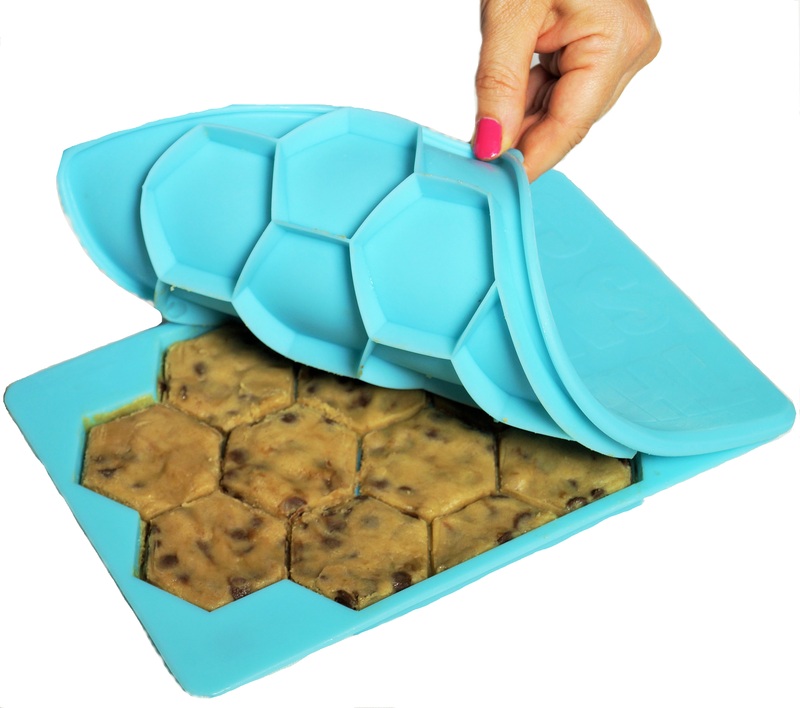 A built-in cutter divides the dough into 12 + 1 perfect hexagonal cookies. To serve, pop out a few frozen cookies onto a baking sheet and bake into delectable rounds. To see the Smart Cookie in action, visit www.getsmartcookie.com. Or head to Williams Sonoma in Yorkdale Shopping Centre this weekend where Maya will be demonstrating her invention. Last I heard, she’s also scheduled to audition on the Dragon’s Den in February. My sister Nancy and I are both impressed with Maya’s pretty Canadian-made tray, and we liked the chocolate chip cookie recipe that came with it. Nancy figures it would be fun to send kids back to university with a dozen ready-to-bake cookies. I’ll be using The Smart Cookie for big-batch cookie recipes. After about three dozen, I’m usually thoroughly sick of baking cookies, and would happily freeze some for another day. I also like the idea of keeping a stack of mats in the freezer, each with batter from a different batch, so you can offer guests an assortment of freshly-baked cookies. And kids with allergies can keep their own cookies in the freezer ready for baking. To find a retailer near you, check out Maya’s website at www.getsmartcookie.com.